C'est quand même incroyable nous deux! Pour la suite, de toute façon, si le 1 me botte bien, je ne pense pas pouvoir attendre la sortie du film N°2, donc oui je pense lire les autres livres avant! Little Lily a écrit: C'est quand même incroyable nous deux! la suite, de toute façon, si le 1 me botte bien, je ne pense pas pouvoir attendre la sortie du film N°2, donc oui je pense lire les autres livres avant! PS: j'ai toujours voulu savoir: comment on fait dans un comm pour citer comme tu as fait ? En deux fois ? : j'ai toujours voulu savoir: comment on fait dans un comm pour citer comme tu as fait ? En deux fois ? à l'autre partie du message que tu veux répondre séparément. Et tu as réussi a comprendre ma petite explication ou pas? Il sort très bientôt sur nos écrans et je suis très curieuse de le voir, car même si je n'avais pas entendu parlé des livres auparavant, j'avais beaucoup aimé la bande annonce qui circulait il y a de cela plusieurs mois. Et oui, c'est bien Jamie, le petit bond. Roooooh merci pour LA photo ( ) et les vidéos! Ok alors on va attendre encore un peu! Y a une fan qui a assisté à la projection et a fait un compte rendu, en ne donnant aucun spoiler sur le film, surtout pour ceux qui ne connaîtraient pas les livres... Elle donne ses impressions sur les acteurs, le fait si oui ou non, pour elle, ils ont relevé le défis d'incarner ses persos et elle est plus que positive. Oh oui moi je veux bien! 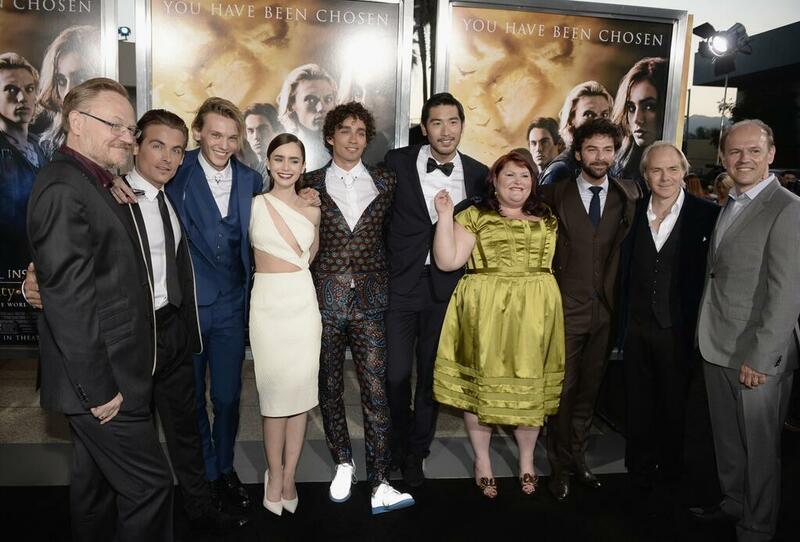 Sur la 4e photo, Lily Collins est en compagnie de la romancière de la saga: Cassandra Clare, qui était aussi sur la photo de groupe. Rooooh merci c'est que du bonheur!!! Et j'ai fini la traduction de la fan qui a vu le film, je la poste maintenant? Shadowhunters! I was lucky to attend an advance screening of The Mortal Instruments: City of Bones on Thursday and I have so much I want to share. I won’t be talking spoilers until the film’s released, but here is my spoiler-free general reaction review of The Mortal Instruments: City of Bones. Being a Mortal Instruments fan site and all it’s easy to believe I’m a little biased when I say that The Mortal Instruments: City of Bones was the best book-to-film adaptation ever. But it’s the truth. There are going to be changes with any adaptation – and there were changes with City of Bones – but the changes didn’t take away from Cassandra Clare’s story. They actually worked. As a fan of the book, I understand that fans want everything to be exactly as it is in the book. And there’s nothing wrong with that. But with every book-to-movie adaptation, change is inevitable. You just have to embrace it. It’s hard to cram a 400+ page book into a two-hour movie. But Constantin Film pulled it off. One of the changes that fans may or may not be familiar with is the fact that they aged the characters up from 15-16 to 18-19 years old. It’s one of those things that book purists might point to when saying the studio took liberties, but it actually worked to the film’s advantage. The movie was able to take on a darker, more seductive tone. The book was dark, but the film was even darker. I believe that it worked to its advantage. The strongest aspect of this film was by far the acting. The entire cast nailed their characters from Jamie Campbell Bower as Jace to CCH Pounder as Madame Dorothea to Jonathan Rhys Meyers as Valentine to Lily Collins as Clary to Robert Sheehan as Simon and so much more. It was A+ acting all around. Lily embodied everything that Clary Fray is. As she’s getting thrown twists and turns every five minutes, Lily is believable and she’s never the victim. She’s always fighting for answers and never gets distracted from her true goal: finding her mother. She’s a strong female character and truly impresses in his movie. Lily was brilliant. But the one actor that will have you bowing down to him by film’s end is Jamie Campbell Bower. Jamie embodied everything that is Jace Wayland and more. After visiting the film set last September, talking to him and seeing footage from the film, I was already confident. But after the movie I left in absolute awe. Everything from his mannerisms to his delivery was spot-on and really commanded attention. His banter with Robert Sheehan’s Simon was a constant throughout the film that was really something special. I know in the beginning a lot of people wanted a different actor to play the role, but honestly no one else could have played Jace the way Jamie did. Jamie is Jace. And you’ll walk out of the theater believing it, if you don’t already. Jonathan Rhys Meyers flat out scared me as Valentine in the best possible way imaginable. One of the things that myself, along with fans, were a little iffy about was the hair. Not only was it not white, but they gave Valentine dreds, which made it kind of hard to take him seriously. But when Jonathan comes on screen he commands attention and his portrayal of Valentine was downright brilliant and terrifying. Robert Sheehan as Simon was the most adorable thing ever. Seriously. Robbie got Simon down to a tee and his comedic timing was sheer brilliance. Robbie was also able to capture Simon’s vulnerability perfectly. His scenes with Lily and Jamie were truly special. His scenes with Lily’s Clary were both beautiful and heartbreaking, as we see Simon go from the best friend to the guy in the background and the aftereffects. My favorite thing was his banter with Jamie’s Jace and it’s one thing that fans will really appreciate and will still be laughing hysterically over when they leave the theater. Kevin Zegers and Jemima West as Alec and Isabelle Lightwood were perfection. Alec is such a beloved and complex character, like all of Cassie’s characters, and Kevin really played that to its fullest. He didn’t make Alec all about his sexuality. He made Alec about the values that believed in and what he fights for. It wasn’t just when he was in the forefront, it was when he was in the background behind Jace or Clary that he shone. Those looks and reactions were genius. He really portrayed Alec’s frustration well. Jemima was everything I wanted and didn’t realize I’d wanted in Isabelle. She was badass, vulnerable, mysterious and every time she was on screen it was something special. She went from being such a sweetheart in real life to being a complete badass as Izzy. The rest of the supporting cast (because this could literally stretch on forever if I go actor-by-actor): Godfrey Gao, Lena Headey, Aidan Turner, Jared Harris, CCH Pounder. They were brilliant. Magnus is such a beloved character and I think Godfrey Gao did him justice. There isn’t much Magnus in the first book, but there is an extra scene in the movie with Magnus that you didn’t get to see in the book. Lena Headey in the short time she had as Jocelyn was such a badass it blew me away. Aidan Turner was truly something special as Luke. He had such charisma, seriousness and vulnerability in the role, which made me love him so much more. Jared Harris was truly astonishing as Hodge. He was able to portray Hodge’s inner turmoil with such grace and dignity. CCH Pounder was amazing as Madame Dorothea. She was so great to watch and it was an honor being scared by her. One of the concerns that I’ve heard from numerous fans is about the humor. Did Cassie’s genius humor make the cut? I’m here to assure you that it did. A lot of fans voiced their concern because of the serious tone of the trailers. Aside from the “Have a little faith,” line from Jamie, people said it was too serious. But you have to understand that in the trailers they’re trying to convey the message of this epic good versus evil battle. That’s the storyline they’re pitching to audiences. The humor is important and definitely grounds the film. I will tease you in saying that there are some lines from City of Bones that make it into the film. So be on the lookout for those! The sets on this movie were absolutely breathtaking. I remember touring the set last year and being in absolute awe of these sets. And seeing them on screen with all of these pivotal moments happening in them was amazing. The music in the film was beautiful. I know fans were worried about the soundtrack, but it’s the score that makes-or-breaks a film. And this score was gorgeous. It flowed really well with the film. There were a couple of songs from the soundtrack in the movie, but it blended nicely with the score. After the film had ended and I watched the credits roll, I sat there taking it all in. I’ve been waiting years for this movie and to see it on screen in all of its perfection was truly surreal. I left the theater wanting more, but also wanting to get back inside and watch the movie again. I want to thank everyone involved with the making of the film for such an amazing product. This movie was epic, mind-blowing, action-packed, thrilling and had me on the edge of my seat. It was everything I was hoping for and so much more. Stay tuned for my spoilery review of The Mortal Instruments: City of Bones on August 21. Shadowhunters! J’ai eu la chance d’assister à la projection de « The Mortal Instruments: City of Bones » et j’ai tellement de choses que je veux partager. Je ne mentionnerais pas de spoilers jusqu’à la sortie du film, mais voici ma réaction générale spoiler-free de « Mortal Instruments: City of Bones». Etant sur un fansite de «Mortal Instruments: City of Bones », il est toujours facile de croire que je sois influencée quand je dis que « Mortal Instruments: City of Bones » était à jamais la meilleure adaptation livre/film. Mais c’est la vérité. Il y a des changements avec une adaptation – et il y a eu des changements avec « City of Bones » - mais les changements ne s’éloignent pas de l’histoire de Cassandra Clare. Ils ont travaillé. Etant une fan d’une livre, je comprends que les fans veulent toujours que ce soit exactement comme dans le livre. Et il n’y a rien de mal dans ça. Mais avec chaque adaptation livre/film, le changement est inévitable. Vous avez juste à vous laisser emporter. C’est difficile de caser un livre de plus de 400 pages dans un film de deux heures. Mais Constantin Film a réussi son coup. L’un des changements que les fans peuvent ou ne peuvent pas être familiers avec et le fait qu’ils ont vieilli les personnages, les passant de 15-16 ans à 18-19 ans. C’est l’une des choses que les puristes du livre pourraient mettre en évidence, disant que le studio a pris des libertés, mais ça a été plutôt un avantage pour le film. Le film a été en mesure de prendre un ton plus sombre, plus séduisant. Le livre était sombre, mais le film l’est encore plus. Je crois que cela a fonctionné et que c’est un avantage. L’aspect le plus fort de ce film était de loin le jeu des acteurs. L’ensemble du cast était en fusion avec leurs personnages : de Jamie Campbell Bower en Jace, à CCH Pounder en Madame Dorothea, ou Jonathan Rhys Meyers en Valentine, en passant par Lily Collins en Clary et de Robert Sheehan en Simon et bien plus encore. C’était un A+ pour tout le monde. Lily incarnait tout ce que Clary Fray est. Avec tout ce qui lui tombe dessus, Lily est crédible et n’est jamais la victime. Elle se bat toujours pour obtenir des réponses et ne se laisse jamais distraire de son but premier : retrouver sa mère. Elle est un personnage féminin fort et très impressionnant dans son film. Lily était brillante. Mais l’acteur qui vous clouera sur place à la fin du film, c’est Jamie Campbell Bower. Jamie incarne tout ce qu’est Jace Wayland, et bien plus encore. Après avoir visité le plateau de tournage en septembre, lui avoir parlé et regarder des scènes du film, j’étais déjà convaincu. Et après avoir vu le film, je n’ai plus aucun doute. Tout, de ses mimiques, de son jeu, retenait l’attention. Sa relation avec Simon le personnage de Robert Sheehan était constant tout au long du film et donnait quelque chose de vraiment spécial. Je sais qu’au début beaucoup de gens voulaient un autre acteur pour le rôle, mais honnêtement, personne n’aurait pu jouer Jace de la façon dont Jamie l’a fait. Jamie est Jace. Et vous sortirez du cinéma convaincu, sauf si vous ne l’êtes pas déjà. Jonathan Rhys Meyers m’a littéralement effrayé en Valentine, de la meilleure façon possible et imaginable. L’une des choses que moi-même, avec les fans, étaient un peu incertain, concernait les cheveux. Non seulement ils n’étaient pas gris, mais ils ont donné à Valentine des dreadlocks, qui peut paraître difficile à le prendre au sérieux. Mais quand Jonathan est à l’écran, il retient l’attention et son portrait de Valentine était carrément génial et flippant. Robert Sheehan était la chose la plus adorable. Robbie s’approprie très bien le côté comique de Simon. Robbie était capable aussi de capture parfaitement la vulnérabilité de Simon. Ses scènes avec Lily et Jamie étaient vraiment spéciale. Ses scènes avec Clary, le perso de Lily, étaient à la fois belles et déchirantes. Mon truc préféré, c’est sa relation avec Jace, le perso de Jamie et c’est quelque chose que les fans apprécieront vraiment et en riront encore après être sortis du cinéma. Kevin Zegers et Jemima West en Alec et Isabelle Lightwood, les jumeaux, étaient parfaits. Alec est un personnage aimé et complexe, comme tous les personnages de Cassie, et Kevin a joué vraiment à son maximum. Il n’a pas fait d’Alec tout à propos de sa sexualité. Il a fait Alec sur les valeurs qu’il croit et pour lesquelles il se bat. Ce n’était pas seulement quand il était mis en avant, c’était quand il était à l’arrière-plan, derrière Jace et Clary qu’il brillait. Ces regards et ces regards étaient géniaux. Il transmet bien la frustration d’Alec. Jamina était tout ce que je voulais et ce que je ne réalisais pas, que je voulais pour Isabelle. Elle était une badass, vulnérable, mystérieuse et à chaque fois qu’elle était à l’écran, il y avait quelque chose de spécial. Elle était passée d’une telle amie dans la vraie vie à une vraie badass en Izzy. Le reste de l’équipe du cast (car je pourrais continuer ça jusqu’à l’infini si je faisais acteur par acteur) Godfrey Gao, Lena Headey, Aidan Turner, Jared Harris, CCH Pounder. Ils étaient brillants. Magnus est un personnage aimé et je pense que Godfrey Gao lui a rendu justice. Il n’y a pas beaucoup de Magnus dans le premier livre, mais il y a une scène supplémentaire dans le film avec Magnus que vous n’avez pas la chance de voir dans le livre. Lena Headey, dans le peu de temps d’écran qu’elle avait en Jocelyn, était une telle badass que ça m’a bluffé. Aidan Turner était vraiment quelque chose de spécial en Luke. Il avait un tel charisme, de sérieux et de vulnérabilité dans le rôle, que j’aime encore plus le personnage. Jared Harris était vraiment étonnant en Hodge. Il était capable de transmettre la tourmente intérieure d’Hodge avec une telle grâce et dignité. CCH Pounder était incroyable en Madame Dorothea. Elle était tellement super à regarder et c’était un honneur d’avoir peur d’elle. L’une des préoccupations que j’ai entendu, venant de beaucoup de fans concernait l’humour. Le génie de l’humour de Cassie en faisait partie ? Je suis ici pour rassurer et vous dire que oui. Beaucoup de fans ont exprimé leur préoccupation à cause du ton sérieux des trailers. A part la phrase « Ayez un peu de foi » de Jamie, les gens disaient que c’était trop sérieux. Mais vous devez comprendre que dans les trailers, ils ont essayé de transmettre le message de ce combat épique du bien contre le mal. C’est l’histoire qu’ils veulent montrer au public. L’humour est important et définitivement présent dans le film. Je vais vous titiller en vous disant qu’il y a quelques lignes du livre qui sont exactement dans le film. Alors soyez attentif ! Les décors de ce film étaient à couper le souffle. Je me souviens quand j’avais visité le plateau l’année dernière, d’avoir une crainte de ces ensembles. Et de les voir à l’écran avec tous ce qu’il s’y passe, rendait le tout incroyable. La musique dans le film était belle. Je sais que les fans étaient inquiets à ce propos, mais c’est la musique qui accentue tous ces moments d’un film. Ca s’accordait parfaitement bien avec le film. Il y avait quelques chansons qui se sont bien mélangées avec la musique. Après que le film soit fini et j’ai regardé le générique de fin. J’ai attendu des années pour ce film et de le voir à l’écran dans toute sa perfection, était vraiment surréaliste. Je suis partie du cinéma en n’en voulant plus, mais aussi l’envie de revenir à l’intérieur pour le revoir à nouveau. Je veux remercier toutes les personnes qui ont été impliqué dans la création de ce film pour un tel produit stupéfiant. Ce film était épique, époustouflant, bourré d’action, passionnant qu’il m’a scotché à mon siège. C’était tout ce que j’espérais et bien plus encore. Restez à l’écoute pour ma review spoiler de « The Mortal Instruments: City of Bones », le 21 aout. Moi, les parties que j'adore ce sont celles-ci, concernant trois acteurs, que j'avais déjà vu à l'oeuvre avant ce film. Aidan Turner était vraiment quelque chose de spécial en Luke. Il avait un tel charisme, de sérieux et de vulnérabilité dans le rôle, que j’aime encore plus le personnage. Roooooh merci pour la review!!!! Et en français qui plus est! En tout cas, ça me donne encore plus envie de le voir! Ah non Lexa! Il faut que tu résistes jusqu'à ce qu'on aille voir le film!